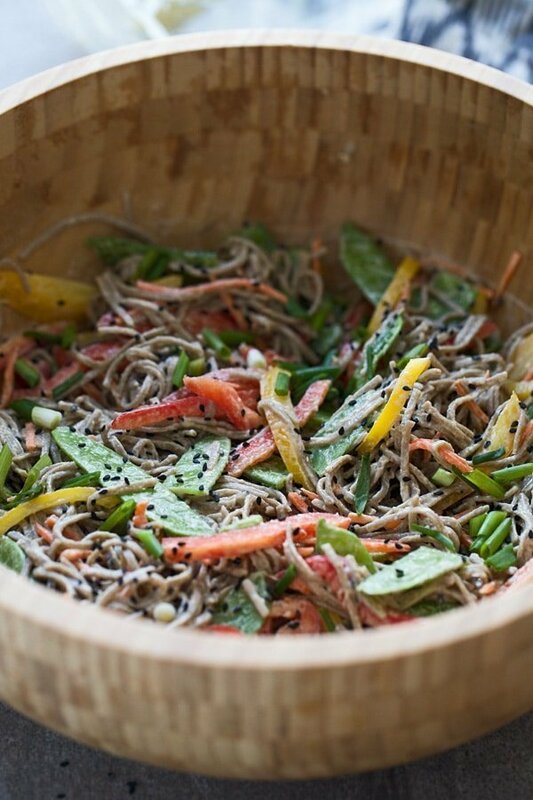 Tahini Veggie Soba Noodles are light, refreshing and perfect for an easy lunch or dinner. 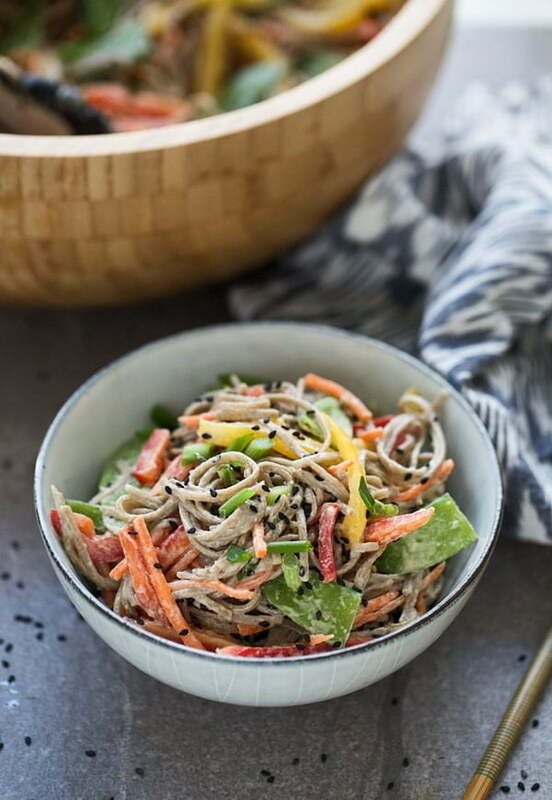 They’re packed full of bright, crisp veggies, nutty soba noodles and tossed in an addictive tahini sauce. Fresh, crisp veggies. Nutty soba noodles. Heavenly tahini sauce. 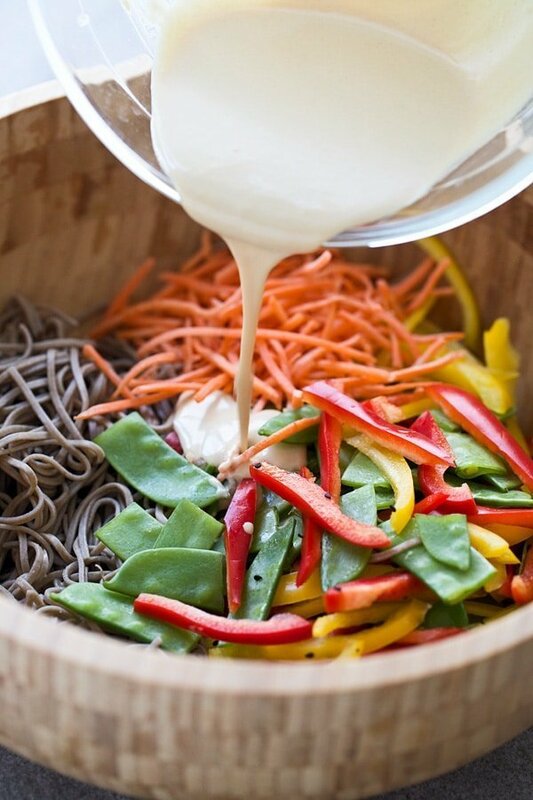 All are the makings of these seriously refreshing Cold Tahini Soba Noodles that I can’t get enough of. While I normally prefer my Asian noodles hot (pad thai, drunken noodles, lo mein, etc. ), when it comes to peanut sauce and tahini, I actually prefer the cold nature of the nutty, smooth sauce paired with bright crisp veggies infinitely more. Plus, with summer right around the corner, this becomes the perfect lunch or dinner to cool you down. Tahini-based sauces have become my new favorite condiment to serve with salads and bowls (like these Greek Meatball Farro Bowls) and I just love drizzling it over seared salmon or chicken for an easy way to step up an otherwise simple meal. Since tahini sort of mimics the nutty nature of peanut butter, I thought (as I’m sure many others have as well) that instead of throwing a peanut-based sauce together when I had a craving for cold Asian noodles, I’d whip up a tahini-based sauce and see how it went. I took many of the same ingredients I use in my favorite peanut sauce – soy sauce, honey and sesame oil– and paired them with a few of my go-to ingredients for my tahini sauce – lemon juice and garlic. What results is a sauce so addictive, I’ve made it three times over the course of a month. 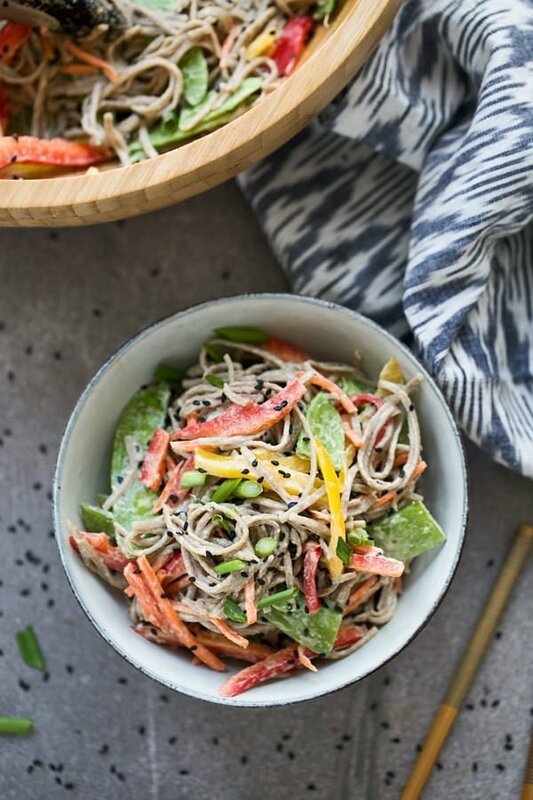 Because I wanted the veggies to be nice and crisp, I didn’t even blanche them, just chopped them up and tossed them with cooked, cooled soba noodles, the sauce and a few teaspoons of black sesame seeds. In this particular recipe, I used snow peas, sliced red and yellow bell peppers, shredded carrots and plenty of sliced scallions, but you could really use any veggie that suits your fancy. Chopped water chestnuts, baby corn, napa cabbage and freshly shelled edamame would also work well. Serve them at room temperature or cold, your choice. Bring a large pot of water to a rolling boil. Season with salt. Add soba noodles and cook until aldente. Drain and run under cool water to chill to room temperature. In a medium bowl, whisk together, tahini, sesame oil, lemon juice, grated garlic, water, salt, soy sauce and honey. Add peppers and carrots to the cooled noodles. Toss. Add dressing. Toss until combined. Add scallions and sesame seeds, toss one more time. Serve at room temperature or store and serve cold. 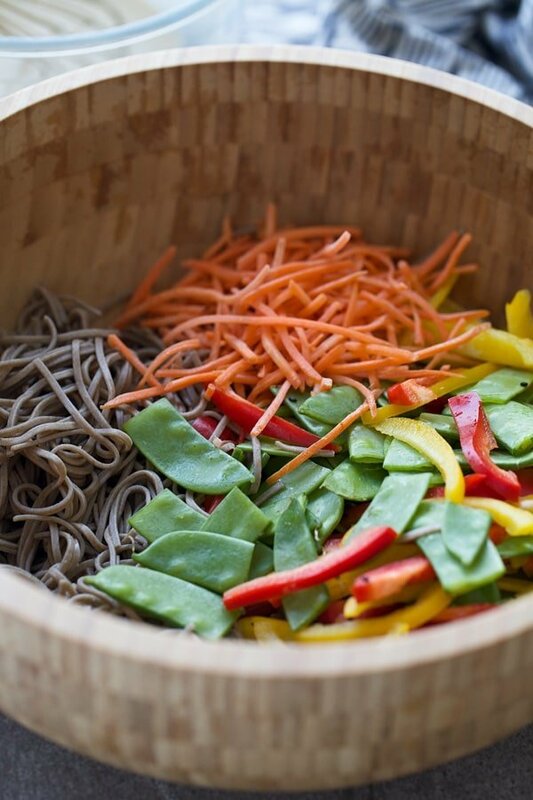 2 Responses to "Tahini Veggie Soba Noodles"
I love this! I will try this at the weekend and let you know what I think… Thank you for sharing! !